People usually have a busier or hectic routine that they might forget to communicate with their friends and loved ones. So the weekend is the time that people often prefer to make calls or do things for which they don’t find time during the working days of the week. But why to wait only for weekends to initiate conversations. A perfect bundle is what we need to stay connected with each other during whole week at minimal rates. Whether you are having a busy or free day, staying in touch throughout the week is necessary. Weekly bundles usually combine flexibility with great value. Different network providers have introduced weekly calls, SMS, internet bundles and hybrid or all in 1 bundle as well. So, the user can choose best among them. 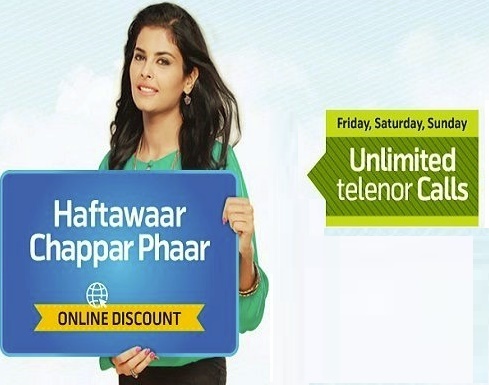 Like other telecom companies, Telenor has also introduced Haftawaar Chappar Phaar offer for their prepaid customers. Subscribe to this offer once and enjoy calling freedom for a whole week at affordable charges. As the name of the offer suggests, you will get more than just free talk time. By activating the offer, you will also get 70 data Mbs. Pay less and get more calling minutes and data Mbs with Telenor Haftawaar Chappar Phaar offer. Talk to your loved ones without any stress with Haftawaar Chappar Phaar offer. This package also offers more discount if you activate this package through Telenor app or website. To know more about the discount offer and other relevant details have a look at the provided information below. To enjoy benefits of the bundle, you have to pay Rs 50 + tax. You will also get the discount on activating through Telenor app or Telenor official website. No additional or extra charges will apply. Enjoy endless talk time with 1000 on-net minutes for weekdays. You will also get unlimited on-net minutes at the weekend. Surf the web for free with 70 MB of mobile data. The activation process of the offer is simple. You can dial *5*700# from your prepaid connection to subscribe the Telenor Haftawaar Chappar Phaar offer. Moreover, Users can also activate the offer through Telenor app or website and get the discount on offer charges. You will receive the confirmation message on successful activation. Offer is valid for all Telenor talkshawk and prepaid customers. Call setup charges of Rs 0.12 + tax will apply to each call. You cannot subscribe this offer multiple times during the subscription week. It can only be subscribed again on the consumption of allocated resources. Daily and 3 day variants of Superhit and Daytime offer cannot be used with this offer. FED tax will apply on the regional basis. The company has the right to withdraw or change the offer at any time. Telenor is delivering more than its user’s expectations at affordable rates. So don’t make any delay and activate this offer to enjoy unlimited calling minutes and data Mbs for a whole week.